To help prevent electrical injuries and deaths, the new 2012 version of the National Fire Protection Association (NFPA) 70E: Standard for Electrical Safety in the Workplace makes important changes in the areas of safety, maintenance and training, writes Wally Vahlstron of Emerson Network Power. Data center managers should be aware of these upgrades to ensure the safety of their staff and contractors. Wally Vahlstrom brings more than 40 years of electrical engineering experience to his position as the director of technical services for Emerson Network Power’s Electrical Reliability Services group, where he is responsible for failure investigation work, conformity assessment services, power system studies and reliability analysis. A service professional is working on a piece of electrical equipment. He’s done it hundreds of times before, but in a moment of carelessness or by total accident, an arc flash occurs. Most of us think this couldn’t happen to us. The truth is that electrocutions are the fourth leading cause of traumatic occupational fatalities, and according to the American Society of Safety Engineers, more than 3,600 workers suffer disabling electrical contact injuries annually. Employees working on electrical equipment without adequate Personal Protective Equipment (PPE) risk serious injury or death when an electrical arc occurs. Even someone standing more than 10 feet from the fault source can be fatally burned. 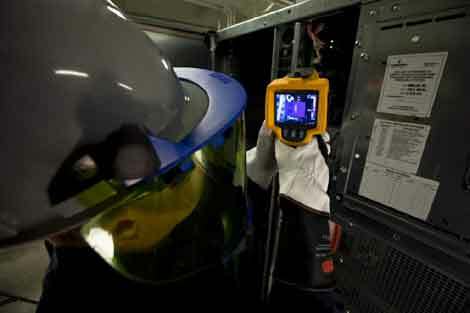 Arc flash labeling is key to preventing injuries. Data centers that have not been vigilant in their labeling may need to create new arc flash hazard labels to meet the expanded requirements of NFPA 70E. Additionally, the previous 4-foot default value for arc flash boundary has been changed to require that the arc flash boundary distance be calculated for all locations where the voltage is greater than 50 volts. The new standard makes it clear that label information should be based on calculated values rather than using the table values provided in NFPA 70E. While there previously was no industry standard, DC equipment labeling is now required. Equations used by state-of-the-art software for calculating DC arc flash values are shown in Section D.8. Using such software is recommended for determining incident energy and HRC. Overall, 2012 NFPA 70E requires more documentation and more training than in the past. This includes documenting the required meeting between employers and contractors to communicate known hazards and installation information the contractor needs to make assessments. Regarding testing and maintenance practices, NFPA 70E now specifies that only qualified persons may work within the limited approach boundary. The definition of qualified includes required training, demonstrated skills, and knowledge of installation and hazards. Additionally, ground fault circuit interrupters must be used where required by local, state and federal codes or standards (OSHA 1910). Before the 2012 edition, NFPA 70E requirements for conducting maintenance on electrical equipment were specified only for overcurrent protective devices. Now, your organization must maintain in a legible condition and keep current a single-line diagram for the electrical system. Additionally, electrical equipment must be maintained according to manufacturers’ instructions or industry consensus standards to reduce the risk of failure and the subsequent exposure of employees to electrical hazards. The standard also now requires showing that overcurrent protective devices have been maintained, tested and inspected according to manufacturers’ instructions or industry consensus standards such as ANSI/NETA 2011 Standard for Maintenance Testing Specifications and NFPA 70B Recommended Practice for Electrical Equipment Maintenance. To fully understand its implications for your data center, Emerson Network Power encourages you to purchase a copy of 2012 NFPA 70E from the NFPA website.